IPL 2019: MS Dhoni fined 50 percent of his match fees for breaching the IPL Code of Conduct. 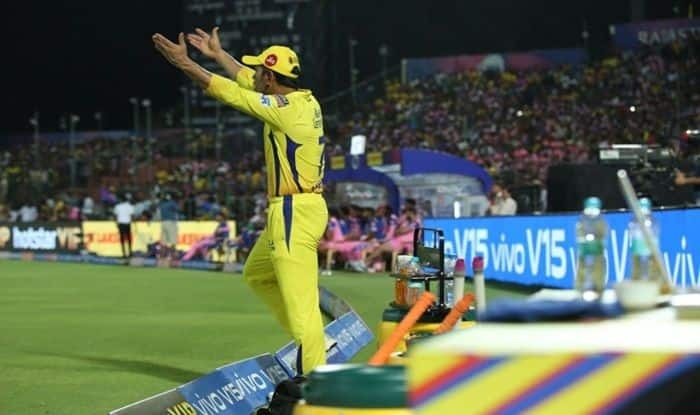 IPL 2019: MS Dhoni has been fined 50 per cent of his match fee for breaching IPL Code of Conduct during the Rajasthan Royals vs Chennai Super Kings match at Sawai Mansingh Stadium in Jaipur. The incident took place in the last over which irked Dhoni to walk into the ground. The umpire stretched his hand and indicated a no-ball but later refused to accept that he had given a no-ball. This disrupted the calculations of CSK who eventually managed to hold on to their nerves to pull off a last-ball thriller. Chennai Super Kings won the match by three wickets as Dhoni starred with a 43-ball 58 to help his team gun down 151. The win also marked Dhoni’s 100th win as captain. Meanwhile, it was Mitchell Santner’s last-ball six that sealed the game in favour of CSK to help them cement their position at the top of the points table. “It was a very good game. Need to give credit to Rajasthan. They were slightly few runs short on what would’ve been a good score. But they put pressure on our batsmen and they were able to build pressure right to the end. Once you win games like this, you learn a lot out of it. It’s important to enjoy the win but also learn from the mistakes. It’s about a few hits. Have to see the ground here. It’s a very big ground and the outfield is fast. At the end of the day, individuals do commit mistakes. But the team has to take the blame if you’ve lost. Doesn’t matter if it was Shardul’s over or someone else’s over. Important to see if the batsmen batted well or whether the execution failed. We’ve got very good support here, thanks to them. Not to forget, one of my biggest innings came here. All games are big game,” said MS Dhoni at the post-match presentation.